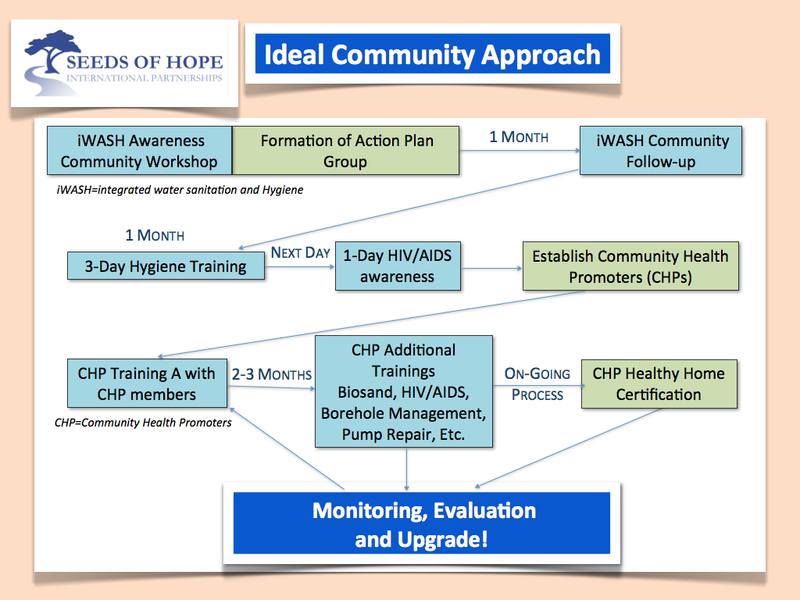 Seeds of Hope International Partnership’s Zambia WET Centre (WASH Expertise Center) is tapping into and servicing people who have grassroots and direct connections to the people who need clean water hygiene and improved sanitation. Individuals, community organizations and NGOs of all sizes are all clients of the WET Center unlike other learning institutions or consultants who only serve certain components. The Center is using a business- like model with good strategies, planning and organization to serve its clients rather than many non-profit organizations who tend to follow the funders or focus on unspecified needs. Using affordable and user friendly technologies such as the biosand filter, eco-sanitation and rooftop rain water harvesting, the challenges of high tech, unsustainable and costly technologies has been avoided. With skilled and highly competent staff, the WET Center can provide general awareness, specific and focussed training, motivation and follow-up service together from one organization to another. Watch this video to learn more about WET-C Learning Exchanges and Seeds of Hope’s leadership role in training other organizations. Our approach to solving problems caused by the water crisis in Africa is called iWASH—integrated Water Sanitation and Hygiene. We offer different solutions, depending on the community’s specific needs and circumstances. Our service and trainings include: Water Well Drilling, Hand Pump Repair, Biosand Filters, Rain Water Harvesting, Latrine Installation, Sanitation & Hygiene trainings, Water Quality Testing, and African Manzi Center (AFMAC).